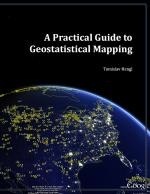 Tomislav Hengl has just released has new book, A Practical Guide to Geostatistical Mapping over at http://spatial-analyst.net/book/. The book is available for free browsing online and as a free PDF download, or you can order a printed copy. The book is made up of lecture material for a PHD course teaching spatial analysis using open source software. All the datasets used in the book are available at the homepage as well." Download the PDF here Interestingly, you can improve the book interactively by using an iPaper application that is part of the www.scribd.com browser. Cool idea.